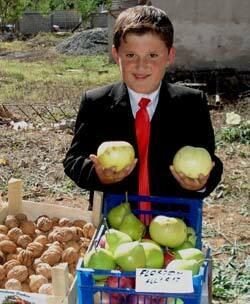 A smart young stallholder tempts buyers with local apples. 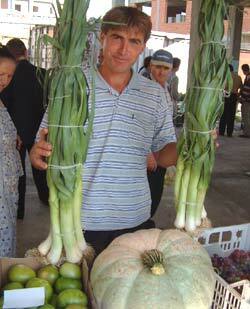 Leeks and squashes entered for the competition. Producers from the 96,000 isolated small farms in the remote Kukes region of northern Albania face extremely tough challenges. The complex jig-saw of small plots, coupled with poor feeder roads, remoteness from the capital, and lack of alternative employment opportunities can make for a depressing situation. Many young people have gone abroad to seek a better life. 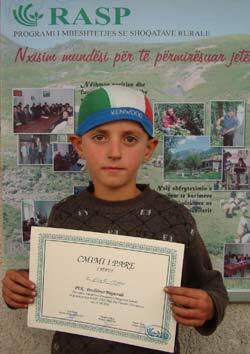 Working with our Albanian partner organisation, a network of small-scale special interest groups has been built up since 2004, representing vegetable and herb growers, beekeepers, sheep raisers and other rural livelihood occupations. In 2006, representatives of these groups came together to form the Kukes Farmers’ Federation. With their new representative status, the Federation’s leaders have already made real progress. For example, they successfully negotiated with the Commune authorities to co-finance the construction of a feeder road for transporting fresh produce from the isolated village of Mustafe to the main trunk road. The farmers contributed unpaid labour, and the Commune paid for the machinery and skilled labour. More significantly, they persuaded the Municipality to allocate a permanent space for a farmers’ market within the newly-constructed wholesale market. This opened up opportunities for direct marketing. 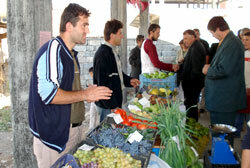 The launch in September 2006 attracted many local customers (see photos), and the Kukes farmers are now busy developing their own-brand produce to distinguish it from imports from large farms in Macedonia. Farmers’ markets have become very popular in the West in recent years: we don’t tell people to copy, but we do help them learn from other experience and adapt ideas to their own situations. At the 2006 opening of the farmers’ market, all the stallholders were male, despite women having showed great interest in the planning stages. 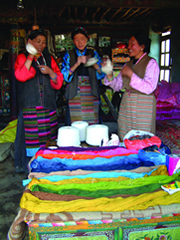 At the follow-up feedback meeting, a visiting (male) consultant challenged the stallholder group, suggesting that wives and partners might also take part next time round, to which the response came back: “If the women come, we won’t!” They agreed, however, that all producer groups could be represented at the market. Our local partner then arranged for members of the new women’s fruit processing group to participate at the next market event, and this helped give confidence to the women. A first step towards a more balanced participation and a more equitable flow of cash benefits. Grant funding from DFID Civil Society Challenge Fund, Balkan Trust for Democracy and Transrural sponsors.